Bhai Fauja Singh. 'Fauja' means soldier, and he truly lived to his name. Much of his life was spent in fighting against unrighteousness and standing up for the true principles of Sikh Dharma. It was just a few months ago that many- Sikhs from the Western Hemi­sphere had the opportunity to visit Amritsar, to be among the people there and to feel the spirit which prevails among the Khalsa of the East. That spirit is especially evident and shared by the Sikhs of the Bhai Ran­dhir Singh group, and during this par­ticular visit to India, the western born Sikhs found a great sense of kin­ship with the Bhai Randhir Singh brothers and sisters. Bhai Fauja Singh, the main leader of the Bhai Randhir Singh people was at that time in prison. 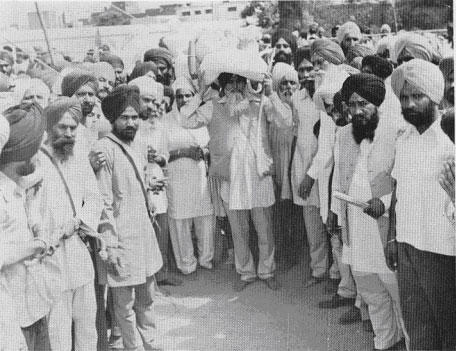 He had been jailed over a pending case, but in reality he was being kept in prison as a means of containing his powerful leadership amongst a powerful group of Sikhs. Nonetheless, his spirits remained al­ways high and his wife Amarjit Kaur often visited us at Guru Nanak Nivas, with words of support, appreciation and encouragement for our inspired efforts to learn and live the life of Khalsa. Arrangements were made, and many of our people went to the jail to per­form Gurbani Kirtan for the prisoners there, and to give a chance for others to visit with Bhai Fauja Singh. Bhai Fauja Singh had been a great friend and source of inspiration to some of our Khalsa family who had visited India in earlier times. Now the oppor­tunity was there to return the spirit of brotherhood which we shared. Tours were also arranged, to go out and perform kirtan at the main villages where the Bhai Randhir Singh people were living. And those times were most inspiring, as west and east joined in devotional singing. Then there was the opportunity to demonstrate 'gatka', the art of Indian sword fighting, and each group took turns in demonstrating their proficiency, with the rising energy of Khalsa brotherhood uplifting everyone. We understood the basis of our bro­therhood, which is sadhana, and it was clear that because these brothers and sisters practice a strong spiritual sad­hana, because they have made it the base of their life, that our kinship runs strong. These are Sikhs who are prepared to live and die for righteous­ness, who exemplify the courage of Guru Gobind Singh in their daily life, who love Nam Simran as their life breath and who recognize the same spirit, the same love and the same infinite vibration of Nam which flows through all brothers of the Khalsa. It was out of this spirit of devotion, this sense ' of duty towards the Guru and towards the essence of the spirit of `Khalsa' that these beloved ones felt the call on Baisakhi Day, the 13th of April, 1978. 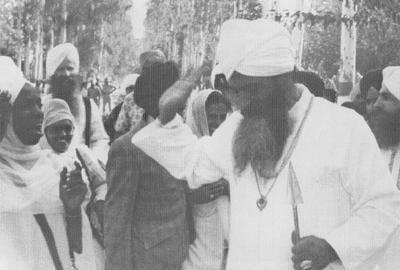 It was in the city of Amritsar, and official permission had been given to the-,'Sant Nirankaris to hold a procession through Amritsar, carrying the man they call their 'guru', Gurbachan Singh around the city on a palki, waving a chouri over his head. It would not take much wisdom to imagine that in the very city of Amritsar, the holiest of holy places for Sikhs. a renegade sect of Nirankaris being allowed to demonstrate their exaltation of a human being over and above the Siri Guru Granth Sahib, that such an action might cause some reaction among the Khalsa. However, nothing was done on an official level to prevent the procession or the subsequent meeting which was to take place. Watching this insult, a group of Sikhs met to discuss a way of deal­ing with the situation. They determined to send a group of 100 peaceful pro­testers to do kirtan outside of the Nirankari meeting. They requested that the leadership and officials of Amritsar give them their support and assistance but this was denied. Nonetheless, the 100 protesters set out, unarmed except with their required Kirpans. There was none there to defend these courageous Sikhs, except their God and Guru, and each one who fell uttered 'Wahe Guru' and surely was received into the arms of the Guru as he died this martyr's death. 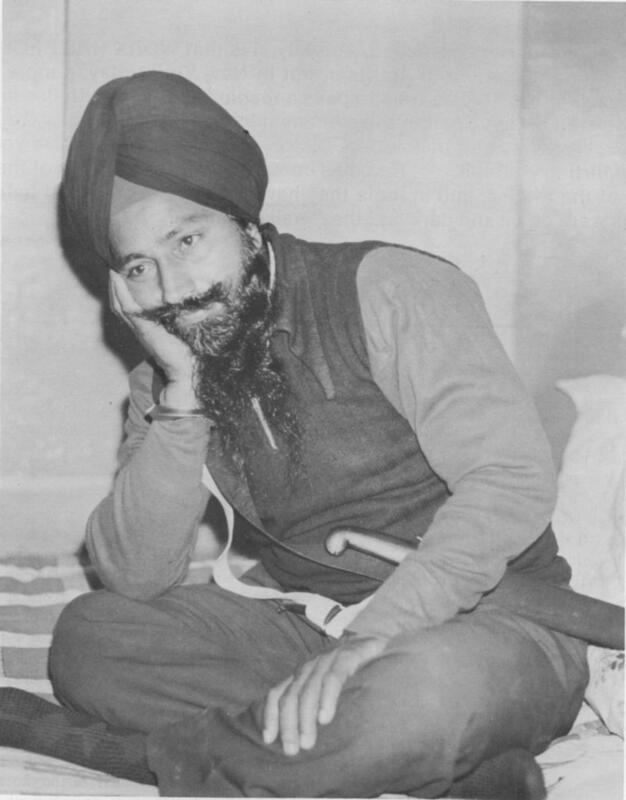 Bhai Fauja Singh himself was fired upon by the District Superintendent of Police, who accused him of being responsible for all of this trouble, and emptied his 32-calibre pistol into Bhai Fauja Singh's chest. These were not the only bullets he was to receive that day, but he kept standing, uttering only `Wahe Guru'. 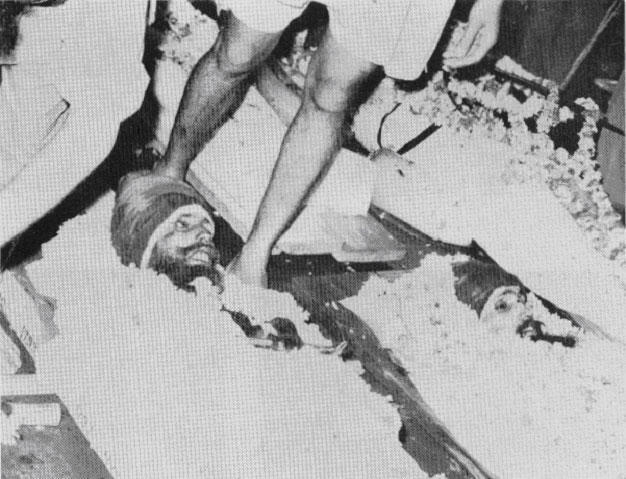 Two Sikhs attempted to carry the still breathing and chanting Bhai Fauja Singh to the hospital for treatment, but those two men were arrested by Police, and Bhai Fauja Singh's body was taken by the police and put into the `Dead Wagon'. Again, another Sikh came upon Bhai Fauja Singh and found him breathing and still uttering Wahe Guru'. He called for someone to help, but half an hour later, Sardarni Amarjit Kaur, his wife, found Bhai Fauja Singh dead. 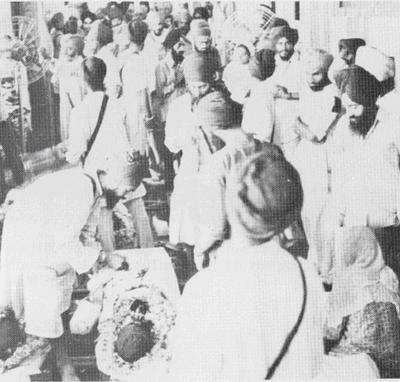 The bodies of the Martyrs were garlanded and respectfully adorned, then were available for viewing by the Sikhs who traveled from all parts of India and the world to pay homage to those who had given their lives in defense of their Guru's honor. In India death is not a mysterious stage of life, it is accepted as a fact of life and acknowledged as the greatest opportunity for merging with the Divine. 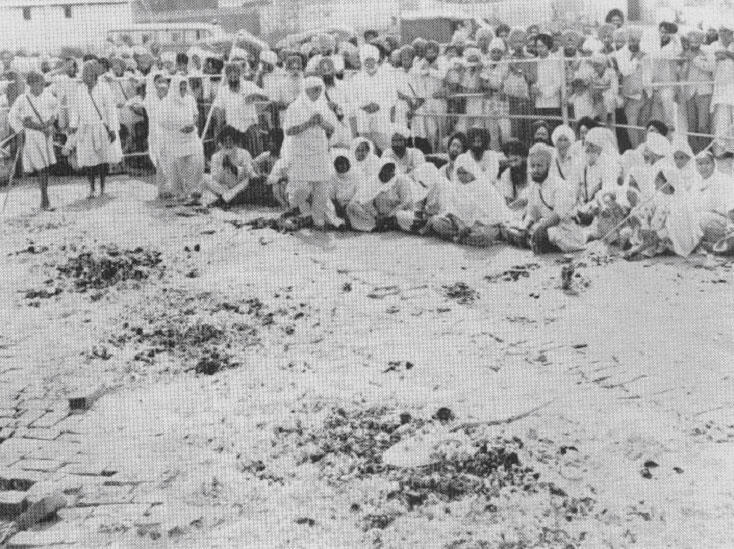 Sardarni Amarjit Kaur stands at the side of her martyred husband, Bhai Fauja Singh. 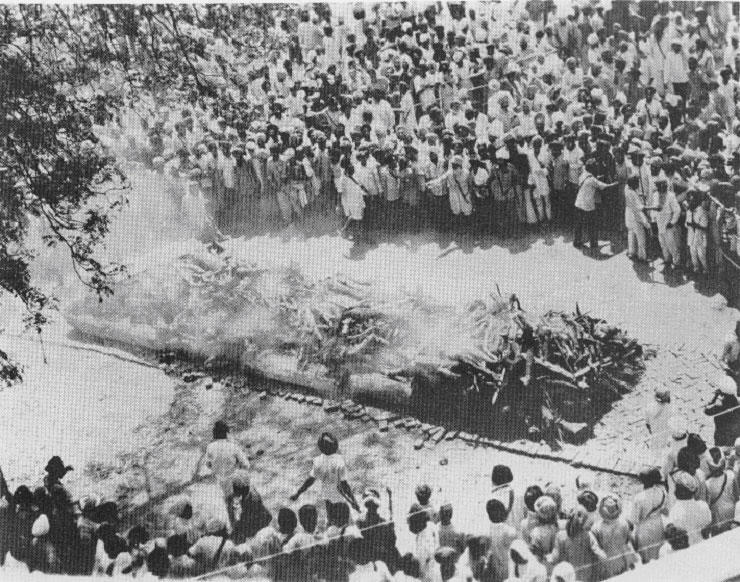 A procession through the city of Amritsar, with the bodies being transported to the cremation grounds. the procession through the streets of Amritsar was led by a Panj Piare (Five Beloved Ones) and adorned by various Sikh banners and flags. 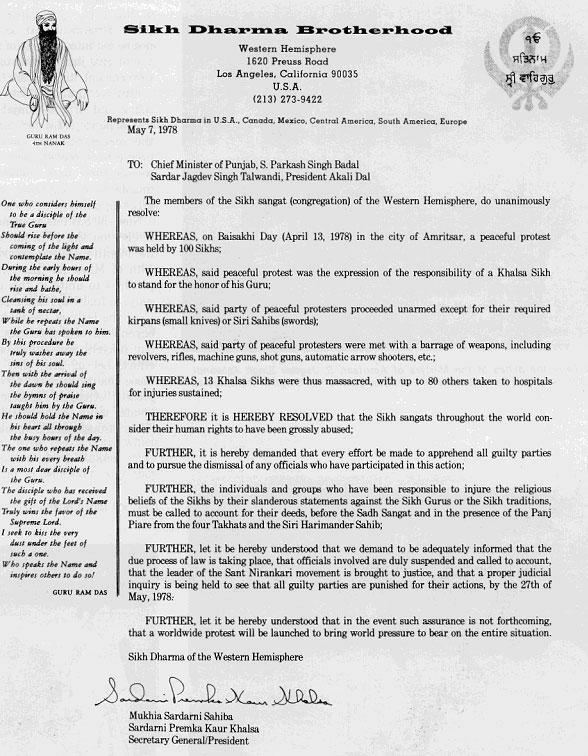 When the news of the tragedy first reached us in the United States, the Khalsa Council was in session. It was already the 18th of April, but we immediately stopped our meetings, re­cited Ardas and gathered at Guru Ram Das Ashram to sing Gurbani Kirtan in front of the Siri Guru Granth Sahib. The next day, the Executive Com­mittee of the Khalsa Council elected to send three representatives to Amrit­sar, to participate in the Bhog ceremony of the Akand Path following the deaths of the martyrs. These representatives were Mukhia Singh Sahib Lehri Singh Khalsa, Secretary in Chief for the Eastern Domain, Sardarni Sahiba Sat Kirpal Kaur Khalsa, Assistant Secre­tary General of the Khalsa Council, and Singh Sahib Swami Singh Khalsa. They arrived in Amritsar, India, just as the kirtan and ceremonies were taking place and remained there for two weeks to help in any way that they could; to see that Amarjit Kaur felt our love and support, and that our strong feeling of personal loss and our sense of kin­ship with all our Sikh brothers and sisters there was received, to see what investigations were going on and what efforts were being made to deal with the situation through the channels of the law, to meet with the Sikh leadership and to express our concern that proper action be taken to appre­hend all those responsible for such law­less actions. M.S.S. Lehri Singh speaks to the sadh sangat, expressing our sorrow at this tra­gedy, expressing our sense of brotherhood with the Khalsa Panth in this moment of loss, and expressing how the departing of these great souls should inspire every Sikh to give more service in their daily lives. To his left is Sardar Gurcharn Singh Tohra, President of the S.G.P.C. The mass cremation pyre is set. All that remains are the ashes ... and the spirit and the memory and the inspired example of their lives lived in the highest spirit of Khalsa. The Sikh leadership has put out a call to the Sikh people, requesting them to be calm, to have patience and to keep faith in their leadership. They have asked that no action be taken up by the masses, and that they wait for one month to pass. Then if the people are not satisfied with the actions which their leadership have taken, they should agitate in whatever way they deem fit. No doubt it is important that the Sikh leadership prove its ability to govern at this time, it is important that the Sikhs remain united and that they not be led into any line of action which would give justification to the Central Government to step in and assume control of the situation-thus of the Sikhs and of the Punjab. But if its just a ploy, just a bid for time, until the sentiments and emotions of the people have cooled down, and then if we see that our 'leadership' has been unable to do anything to apprehend all of the guilty ones. Then what? Now the S.G.P.C. is sponsoring a con­ference on the 17th, (already pushing the month's waiting period beyond the 13th of May). At this conference, the panth is to unite in this common tra­gedy, to find ways and means of organ­izing the body of the Sikhs above and beyond all of the politics. Let us add our prayers and our energies to this effort. Let us pray that the lives of these martyrs may serve to bring greater strength, greater spirit and greater unity to the entire body of the Sikhs throughout the world. Blessed to carry the ashes of the Martyrs of Amritsar, S. Jagdev Singh Talwandi, President of the Akali Dal Party, Bibi Harcharan Kaur, Sant Jarnail Singh of the Bhindran wale Sikhs. 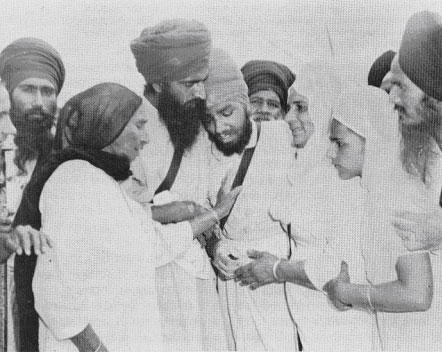 Sant Jarnail Singh, the leader of the Bhindran wale Sikhs gives help to S. Amolak Singh who is still weak from his injuries and wounds sustained during the massacre. S. Amolak Singh had been carrying the ashes in the procession following the cre­mation ceremony for the Martyrs of Amritsar. Sardar Hukam Singh acted as the official representative for the Sikh Dharma of the Western Hemisphere as well as for the All-Canada Sikh Youth Federation of Van­couver, at the Bhog ceremony for the Martyrs of Amritsar. The above Resolution was mailed out with a covering letter, to Sikh organizations and Gurdwaras around the world, calling upon every sangat to be prepared to launch an organized protest by the 27th of May. This protest was to resume in case we did not receive any assurance that government officials or agencies were taking adequate steps to apprehend the criminals and to prosecute them by the due process of law. The Embassy of India was notified of our sentiments and of our intentions. On the 19th of May we received the reply from the Embassy, assuring us of the efforts to be made by the Government of India to see that all parties are duly apprehended. They also requested that we avoid any worldwide protest at this time. The same day the Siri Singh Sahib received a call from the office of the S.G.P.C. in Amritsar, which had been contacted by the Central Government. They also requested that we postpone our protest. In response, we have advised them of our willingness to accept another date, which they should suggest, by which matters would be resolved. We appreciate that the longer we wait, the better we will be in a position to organize our protest on a worldwide basis. We also are certain that we are not going to forget this massacre, and we will be watching and waiting to see how this matter is handled in India. We have received so many copies of letters written by Bhai Fauja Singh, along with people's stories con­cerning their personal experiences with the Bhai Randhir Singh Sikhs in India. Bhai Fauja Singh, from his first contact with the American Sikhs saw the manifestation of the prophecy of Guru Gobind Singh being fulfilled. In that hope and with that spirit of gratitude, he related to every American-born Khalsa. With each one he also found a special link, and with some a link which perhaps ex­tended back into past lifetimes. Some of us were not fortunate enough to meet him in person, but we have dedicated this issue to that Khalsa spirit which he embodied and for which he so joyfully gave his life, and through these pages you will come to know him as he will ever live; a hero, a giver and a Saint. It is easy to understand how God and Guru were preparing him for martyrdom, during his medi­tative months in jail Now let us offer a prayer that we should all take full advantage of the example and the spirit which he has dedicated to the future of the entire Sikh Panth. We both are Chardi Kala and pray for you to be in the same climbing trend of life. The moment you left us we started receiving affectionate and spiritual waves from you constantly but we were some what surprised for delay in writing to us. We didn't receive your first letter. We have received your second letter and we both are touched to read it. It is representing the same love we expected from you. We are also happy to read that you have remembered your promise of becoming a good child. A real love is that which lasts for ages together. I wish that you should continue to remember this noble promise throughout your life and in next lives also. I may remind you of your promise again in your own words, "I will become a better Gursikh of Gursikh parents." If you are working hard and honestly for ideals we congratulate you for the same. I am also very happy that you are desiring less and I hope you will work and serve the 3H0 family headless. The aim of Guru Gobind Singh's Khalsa is serve the mankind headlessly. Those who don't take rest and keep busy, they provide rest to the man­kind and to provide rest to the mankind is the real object of the Khalsa and 3H0. enough to spread his personality and ideas. A bad man living in a bad way will spread dirt to the mankind and a lucky blessed one must impart blessing to the misguided mankind. If the people of America are not hospitable and cozy, you have been sent to this land by the great lord, Guru Gobind Singh Ji, to teach these people to become cozy. If my sweet Lord kindly returns you to India by his sweet will I will be happy and thank Him and learn and share the Khalsa spirit prevailing in you. I have noticed oceans of love full of Khalsa spirit in you all. If the people of the world don't take advantage of this spirit and love then something is wrong to the store of their luck. We have found some deeply concerned and related spirit in you and Sat Kirpal Kaur Ji. We are also re­membering to Kirnjot Kaur. We gave time to see Ram Das Kaur to see her in her last visit but could not reach in time. We beg pardon from her and Taplewala Singh. Say my Fateh to her whenever you see her. The way of life which Guru Gobind Singh Ji has given and has been transferred to you by Siri Singh Sahib Harbhajan Singh Yogi or by any other source is the only way of salvation of mankind. When the world will come to know that the American Sikhs get up early at 2 A.M., they will be amazed and there will be secret mouth to ear talks and discussions about you in streets, in homes, and in all gatherings. I mean your true lives, practical lives, your sacrificed lives, your devoted lives will un-earth the hidden truth. But those who carve the way of truth on the minds, on the rocks, on the roads and on the entrances of war fields they never desire, never hope and never bother for leisure and pleasure in life. Their lives are a constant struggle and they never stop and rest. Sleeps, rests, oppo­sitions, hinderances mean nothing for them. Their aim is to live a Holy life happily in face of all worldly attractions. Matter and good luck in terms of money mean nothing for them. Believe me, Guru Gobind Singh Sahib has sent such type of lives himself to all parts of the world and all these lives will rise in unison and the world will see the beauty and charm of spiritualism. Only then this planet will have a sigh of relief from its sins and problems. Further, believe that you are amongst those specially equipped souls and all unexpected and impossible things will be made possible by you. Guru Gobind Singh Ji many times has sent messages to this earth in many ways and recently in city Todh Pur of Rajasthan in India he has given a message to one Mohammedan that he should convey to the Sikhs that they are getting a heavenly honour and worldly ownership in 1985. Guru Gobind Singh talked to this Mohammedan in his senses with these very eyes. Guru Gobind Singh was with his 96 Krore Khalsa. 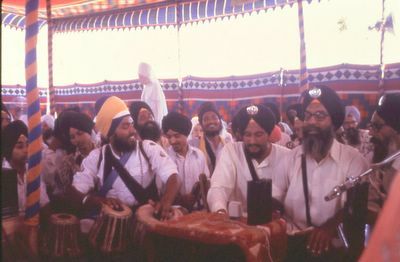 A large number of Shaheed Sikhs were with drums, bands, roars of horns, etc. You should increase your speed so that preliminaries for the Great Lord are complete. This idea that the people don't believe in God will be vanished soon and the earth will have a positive faith. Received your letters and we are very happy to read that you are trying your best for self-improvement, self reali­zation, and meditation and service of Khalsa. We are very much late in writing and in replying your letters. On this side we were also very busy for expansion of Sikh way of life in the villages near our Khalsa farm. We went to villages on foot from place to place. People took Amrit in hundreds and promised to live a truthful life. A large number of people are ready to take Amrit. So, this way the process is going on. The people throughout whole of the world have got tired from intoxications and sins. So they are waiting for an alternative and relief from all these troubles. Now only true and sacrificed lives are required to become a light house for all these misguided ruined and dark-wandering people. We are giving a dim message to the people but we are gazing at you American Sikhs to carry this message of truth, message of complete light and love to the world. Our life is going well; holy, happy, and healthy here. You have asked about the Sikh community, I may assure you that it will also go in Chardi Kala, for the reason that it has got some real and devoted persons like Yogiji and American Sikhs and Soorya Kaur. Pay our heartiest bravo to Yogiji and all engaged companions. I am very sure that capable Guru Gobind Singh will honor his every labor for spreading truth and uplifting many hopeless lives in the world. I feel that Yogiji is the best spiritual worker of Guru Akal Purakh. There are very rare drawbacks in him but these will be ignored in heaven and he will enjoy the warm love of Guru Gobind Singh in the final accounts. All honest and inspired Sikhs in India like him and respect him. I also send my respect to him and his 3H0 family. Say my Fateh to Sardar and Sardarni Yogi. We are four Khalsas in this jail, from Khalsa farm (the name of our farm is Khalsa farm). All are happy according to sweet will of God. We have been involved by the police in one murder case. The whole story you will come to know when you come to India. The previous case of Amritsar is yet unsettled and a new one has started. We are very happy and in Chardi Kala. Your mummy is also in Chardi Kala. All the cases will be settled by our clouds. Clouds can never permanently surround the moon. God has given us ample time to improve ourselves in this jail. Time is precious. I also request you to forget every­thing of this world and enlighten your soul in such a way that you are imbued in Nam. Before the creation of the earth there was darkness everywhere. Ultimately light from God came to light the darkness. Similarly our body is like darkness and to enlighten it there is a need of light from God. This light is actual light and not merely a light of good thoughts. This light is the beginning of our journey to the Infinite. So always seek to be absorbed in the Eternal and Infinite. We want direct friendship with Yogiji so that we may be helpful to each other for a common cause of truth. I hope you will provide a link between us. I will be hoping for a letter from him and a meeting when he comes to India. I am a very liberal man and agree with him nearly in all the steps taken by him to improve the spiritual status of the world. I realize that he is a great man and he has done the biggest work in this century. A large number of pages in Khalsa history have come to this earth in this age, but he has drawn a fairly marked big line. When he writes me I will send some suggestions for a healthy collective spiritual future of Khalsa. 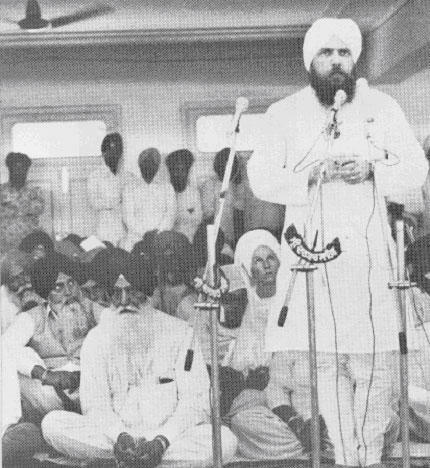 In 1975, Bhai Fauja Singh was photographed while sharing inspiring words on the life of Guru Gobind Singh with American Sikh brothers and sisters. I have read your letter. Don't think we have not tried for acquittal and made full efforts and also will in future. But, if by the will of God I am kept here it is alright, no harm in it. I am feeling quite blessed here. Enough regular time for meditation and spiritual studies. The walls of the jail cannot confine the spirit and flow of Khalsa. Khalsa is a bodyless being, he is a fragrance and the fragrance cannot be stopped by the walls. I simply pray that God should bless the fragrance to me here. Have received a letter from you. Also received sweets (WHA GURU CHEWS) and two copies of Beads of Truth. Have received Yogi Tea. Thanks for all. All the system of heaven and earth is going according to grace of God and Guru. And those who get imbued in the truth of His Name are the part of the same vast force. Firstly, with the grace of Guru one gets knowledge of His Name in good company of the Khalsa. He also gets inspiration in the company of Khalsa and practices this knowledge. After a long practice, one becomes a true Khalsa. I mean one becomes true spirit beyond the weaknesses of body (flesh). This is a stage with the grace of the Guru that one sacrifices to preach this true spirit further to the mankind. If he does not feel a thrill to preach further, I can definitely say, one has not yet got the Khalsa-ism. When he attains it, it becomes instinctive within him to preach it. Then he does not go out under the protection of S.G.P.C. or police of the times. He can face loneliness, he can face separation, hunger, tiredness, piercing sun or cold. He exclaims this truth; he gets insulted if they in­sult him. He does not mind opposition if they oppose him. He gets dragged, if they drag him. He gets stoned, if they stone him. He can cross the mountains of Himalayas to reach Tibet without any protection on foot to preach. Also, he can cross the dense forests of Brazil for the same purpose, even if he has to sacrifice his life. He does not mind death for the true cause. It is profitable, enjoyable and pleasurable to him to cost him his life for this end. This is really healthy, happy and holy for him. 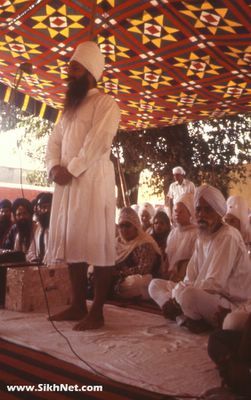 In more carefree days, the American Sikhs are pictured participating in Gurbani Kirtan with the brothers and sisters of the Bhai Randhir Singh jatha. In the end, I want to speak clearly to you that you should shun your fears of newness of country, people and language. You should move through villages from one place to other continously for a time. People will welcome you everywhere. But you should not mind even if you are hooted at some place due to some misunderstanding. By a considerable patience you can remove the misunder­standing from the minds of the people. You should keep on smiling in every tense situation. You will see that very shortly people will realize everything. Our respectable brother, Bhai Sahib Harbhajan Singh Yogi, has given faith to your land by a considerable patience and you'll have to revive faith in the minds of the people of this land by a considerable patience. Now, learn from and teach to the land of your father Guru Gobind Singh. May God bless you with strength and energy to vitalize your fatherland. We welcome you all to this land. I am sure if a group of 200 Khalsa, white swans go through the villages, it will change the face of this land towards reality. Invitation to perform a Kirtan Programme in District Jail Gurdaspur. We, the prisoners and Under trials of this jail, have come to know that you have brought a team from America to perform 'Kirtan Programmes' in different place` in Pun­jab. We eagerly desire that you should give a programme to us also. We cordially invite you with your team to fix any date between 19th to 25th instant for this purpose. Our jail authorities have very gladly accepted to get this' Kirtan Programme' held in District Jail Gurdaspur. on behalf of Prisoners in U.Ts., District Jail Gurdaspur. Waheguru Ji Ka Khalsa Wahe Guru Ji Ki Fateh. Thanks for the visit you and S. Swami Singh ji have given to us in this home (in jail). I have not been able to discuss any important matters with you as I wanted. The message I want to convey to all my friends is like:I am put into this jail neither by the opposition nor by the Sessions Judge, Gurdas Pur, but I have been put in jail by Guru Gobind Singh only; not to be punished, but to be blessed. It is a period of complete rest, the like of, one always wants. Simply one has to understand the will of the Father. I feel we should go a righteous way and not stop. The harassment caused by those who become our enemies initially and ultimately both are the results of the Supreme planning. We cannot avoid, may we try any harder, any battle in life, any imprisonment, any death sentence. If we stop, we are not Sikhs, and if we continue the truth­ful way, positively we will come across all these occurrences, like harassments, fights, battles, imprisonments or death sentences. All these are the duties of a Sikh. The sooner he performs the better he feels. Don't feel that struggle is the way to trouble, rather, struggle is the way to a secret peace. When you give a bugle call it means you are ready. This readiness is the pure spirit but it should be a spirit not a talk. When you talk a thing some people who agree with you will stand by you and those who don't under­stand you will stand against you. It has always happened and it will happen always. Right will stand by you and devil against you, provided you are righteous. Game starts. You will gather strength day by day. Weaker right on your side will leave you to make you still more pure. Weaker devil on the devil side will leave the devil to make the devil more weak, and ultimately the devil will vanish, leaving you victorious in the play field (battlefield) provided you continue to make extreme sacrifice, i.e. righteous death-a permanent peace. The aim of life is to see God through Guru. Our Guru is Nanak, Gobind Singh, Guru Granth Ji, Akal Purakh, Ultimate consciousness. This aim can be realized through sacrifice and understanding the will of our Father. So to go a righteous way and self-sacrifice is the media of achievement. So why to save, why not consume our lives for a righteous end? Our Guru Gobind Singh sacrificed his parents, children, beloveds and all belongings for Truth, and where are those now who did not allow their children to die for the Guru? All dead. This is to be understood that time passes with its usual speed. Realize the time. How it is. Don't delay, start honestly. We should sacrifice ourselves, otherwise after some time we will have to repent for our slackness and duality. Let us be lions, the Singh Sahibs, to kill the lambs in our own personalities. The moment the lamb is killed in our per­sonality we will blossom in all troubles and in all happinesses; a constant joy will prevail in all our motor and sensory nerves. We have been put into this jail by our own Guru to gain energy and develop potential. Now we are going in a dormancy, safe, peaceful and a most profitable period. The moment He feels that we have been sufficiently blessed and a proper potential developed, we will be released to act and live His own designs and supreme plans for the truth. I may assure you that He Himself sends energy in all odd periods like struggles, troubles, battles, wars, imprisonments, or death-sentences provided we are patient, positive, faithful and heaven-lookers. If He intends, He develops such a peace in the devotee that can never be shaken in any odd circumstances mentioned above. I have not mentioned disease and poverty anywhere as odds because these mean nothing for a Sikh. These are very minor tests for a Sikh, a Singh Sahib, provided His love is with the Singh Sahib. The journey is successful for those who have met the pure ones, pure Khalsas; they never perish, become pure light, become pure souls and never reincarnate; and ul­timately live in God-a constant Amrit peace. In the end I bow to all of you; I welcome all of you; I wish you for yet more purity, and with tears of love I meet and depart from you and again see you in supreme peace-an extremely still, heavenly peace. We have received your letters with enclosures about S.Bhag Singh, S. Bikram Singh, and Sant Harcharand Singh Longowal. We are happy to note that you are taking great pains in extending the truth over the world. You have written me that I am released on bail and out to serve for awhile; please forget it. I was never in jail. Kindly, ensure in mind that Khalsa is not a body, it is Spirit. He works and vibrates equally in jail and outside. I never felt hampered there. Even the big dacoits in the jail were diverted into Khalsa and they made pledges to serve the Khalsa Panth and those who commit like this are mostly released and this way a stream of good persons from jail to outside is continuing. Don't feel that I will go again in the jail. I was never in the jail and will be never in the jail. I am always in the jail of my dear father Sri Guru Gobind Singh Ji Maharaj. If He wills no force can stop the function of the Khalsa. Secondly I want to assure you that don't feel that you are segregated or may be segregated from Khalsa Panth. You are a part of Khalsa Panth, Hari Mandir Sahib and Sri Akal Takhat Sahib. You have been accepted by the Guru and no force can take you away from the Guru. Guru is great, seek help from Him. It is written in the Holy Granth that to seek any help from others is not the way of Khalsa. Khalsa always looks for heaven and heaven is the pool for all energy to Khalsa. This energy has always been coming to Khalsa for cen­turies and this flow will continue in future. Khalsa never means any conclusion. Khalsa's gait is like an elephant. A large number of dogs bark at him, but he always goes his way undaunted and never hints any attack to them because he feels that they can do nothing to him. Khalsa means a figure of complete confidence and this can never be shattered. I request you simply to become Khalsa in pure sense. There is written in Gurbani that large forces of the proud kings can be dashed and finished very shortly by the small­est creatures provided they are blessed by the God and Guru. You simply bother for blessings from Guru and remain very peaceful, God will do all things in your favour. Khalsa knows no defeat. But this stage comes when he wants to happily sacrifice his life. A fully dedicated person will do such things in the world that it will be difficult for the generations to believe. It is difficult to believe that a young man of 25 years can live alive for 21 days without skull. It is also difficult to believe that a person can fight without head. We need not bother much about the organization we are already very much organized as a part of the army of Akal Purkh. Our eyes are always towards the sky and we are receiving all help at all wanted times in much more amounts than expected. So we are feeling that same will continue in future also. The jail was a place which Bhai Fauja Singh utilized for strengthening his Sadhana, for perfecting his meditation, and for ex­periencing his Guru preparing him for the next challenge on the path of Dharma. 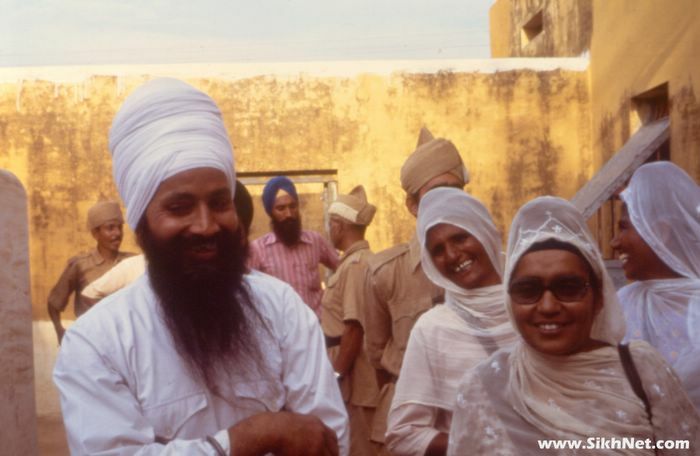 During the visit to the prison, Bhai Fauja Singh is photographed with his devoted wife, S. Amarjit Kaur. I am devoting much of my time in meditation and I am feeling and experiencing a big wonder that the needed organization and all other needed items are coming in the rush around me ... And I am very much sure that the power, organizations, money, command, authority are in the NAM. If we will bear NAM in our heart all these things will come to you and you may use these above points to spread your ego and personality in the world, or you may use all these powers to benefit the earth. Those who will use these powers for personal ends these powers will prove disastrous to them and they will become the 'RAKSHAWA' (GUNDAS i.e. murdering thieves) and those who use for development of Khalsa these powers will become the saints and stars of the earth. So don't worry they are making their way to hell; you make your way to heaven. If they don't become gundas who will call you saints? If they don't become bad who will call you good? You are very lucky to become a good and saint. Saints through all the ages have been defended by the heaven. Is it in your knowledge in any way that the Guru had any news agencies or press reporters? The whole of the Mugal empires spread over 3 thousand miles kept on a war against the Guru and Khalsa. 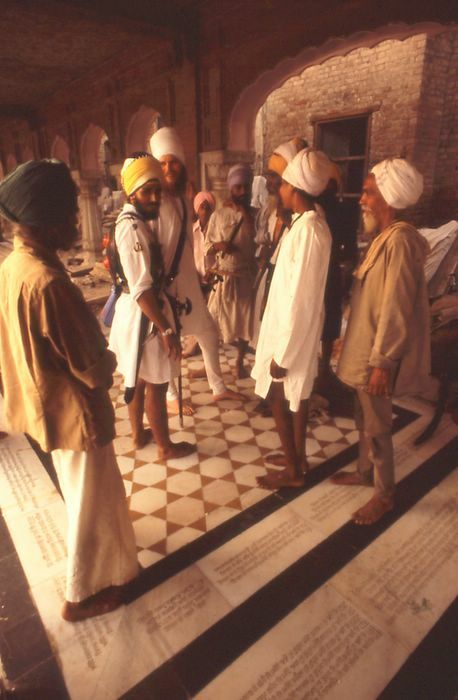 The Khalsa always kept silent but their personality and spiri­tuality attracted a certain number of headless people. This number at a time reduced to 20 thousand living in jungles and from that number they multiplied by giving tough defeats to the states and capitals of India and also to the invaders of India. 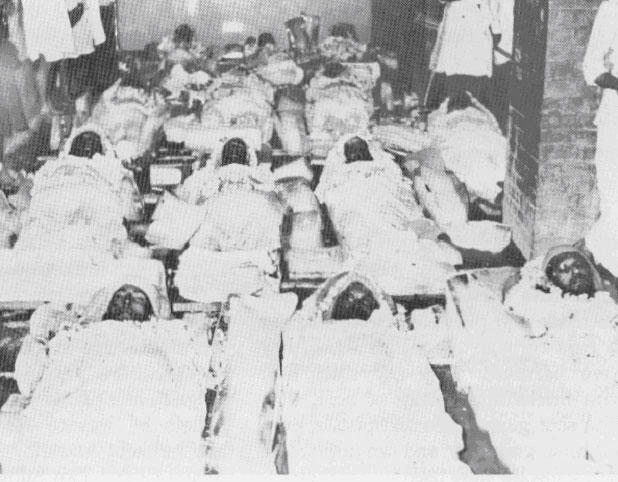 As long as the Sikhs stuck to the instructions of the Guru about spirit, mind, body, they did not see the face of defeats, but when they left the way of Guru, they saw bad waters and again after realizing the real trouble about forgetting the way of Guru, they practiced the teachings of the Guru and became strong enough to survive as a com­plete nation. So I stress the point to live a Khalsa life full of love of God. I may humbly inform you that God is very much fed up with the Gurudom personality cult systems. Now he wants direct continuous and affectionate prayers of the human beings. Resultantly I request that Nam is the key of all organization. I want to write one story about the 10th master. When in his last war he was stopped by Sarsa Nai (river) there was a bloody battle on the bank of this river. Early in the morning Guru ordered to start the morning prayers and ordered a portion of Sikhs to con­tinue the defense. Such a risk proves that our Guru came on this earth to give Nam to the poor and needy persons of this country. It is not that he was against the organization, his forces were the result of the organization, but this organization was made by the will of God. So, the fundamental point is to absorb Nam 24 hours. This Nam into the hearts of the brave persons will create a large number of saint soldiers which is the personal job of the Almighty. In the end I may assure you that with the Grace of God we will sacrifice our lives for this cause. Every drop of our blood will be shed before you are segregated from the Khalsa Panth. We will bear all troubles very happily and calmly before any harm comes to you in India. Next you have written about the removal of patits' from the Takhats. But at this time there are mainly patits on the Takhats. Sure a time will come that these Takhats will be cleared from the patits but such clarities need pure blood to wash. We are preparing the nations just in the tone of NAM; very peacefully in all rush, and very slowly in all hurry, and affectionately in all oppositions. We are doing in undoing, we are running in rest and organizing in all weaknesses of the nation. It is all in the hands of Guru about the place where He keeps us but at this stage we are not intending to come to America. We have got full confidence in your mission there. May God help you to progress there. Kindly send copies of this letter to S. Nirinjan Kaur, Soorya Kaur, Bhagwati Kaur, Hari Krishan Kaur Swami Singh. Our Gur Fateh to Bibiji and Bhai Sahib Siri Singh Sahib Harbhajan Singh Khalsa Yogiji. My dear brothers Gurubanda Singh and Ram Das Singh who has written me letters, please send copies to them also. This is the story of the beginning of the association of the Khalsa of the west with the Bhai Sahib Bhai Randhir Singh Jatha of India, and is intended as a tribute to those Thirteen Martyrs of Amritsar. Let me begin by sharing the essence of the Hukam which I received when I went to the Siri Guru Granth Sahib for support upon hear­ing of Bhai Fauja Singh's death. The current of avarice is all like the dog's madness; this rabidness has spoiled everything. Then taking up the sword of Divine e Knowledge, the Great God did slay it. Save, save, save Thou me, 0 my Master and rescue me by shower­ing thine benediction. Nanak, I have not any other support; the Great True Guru has ferried me across. 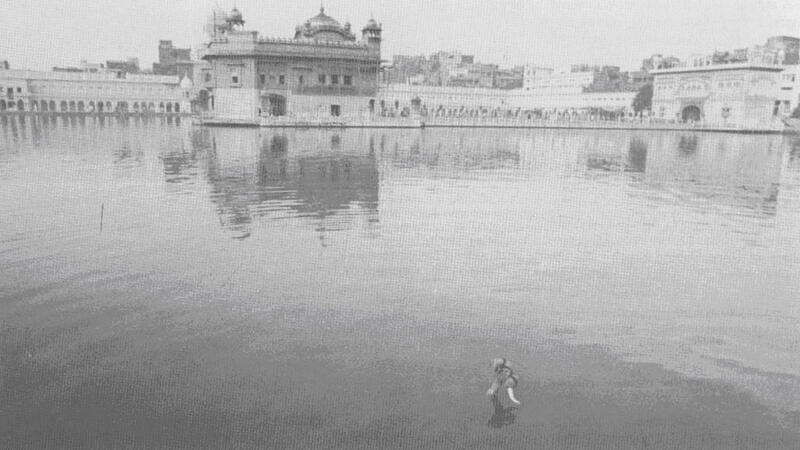 In the spring of 1973, I made my first trip to India and the holy Harimandir Sahib. Early one morning as I meditated within its gold and marble walls, I felt myself being pushed a little this way and that way as more people entered the temple. I tried to make myself take up as little space as possible and also not to break my mental con­centration upon the Gurbani Kirtan. But finally when I felt some pressure upon my knees, which I had pulled up to my chest, I opened my eyes. There I encountered the eyes of a girl of about twelve years old looking up at me. More surprising though was that she was wearing a turban! I had never seen an Indian Sikh female in a turban and I myself had just started tying one. For the next few mornings, she (Sat Nam Kaur) was always in the Golden Temple very early and would immedi­ately seek me out. After many requests from her, I went to meet her Khalsa uncle and aunt, Bhai Fauja Singh and Bibi Amarjit Kaur. It was quite an adventure for me to follow her down the narrow streets of the city and up a darkened stairway, because we were kept very cloistered in those early days due to certain elements of the political climate. That was the start of my association with the Bhai Sahib Bhai Randhir Singh Jatha. In later conversations, Bhai Fauja Singh said that even though most of us had not taken Amrit and we were not in full Khalsa bana, he recognized in us the prophecy of Guru Gobind Singh that the Khalsa would flourish in the west. He asked many questions about how we became Sikhs, our re­lationship to Yogi Bhajan, what we were taught, and what we believed. That quality in him remained through­out our friendship, as he continually asked me to explain all the foundations and facets of our understanding of Sikh Dharma, its relation to yoga and 3H0, exactly how we meditated, and what our plans were for the future of service to humanity. We corresponded after I left India. His letters were al­ways a source of inspiration and a reminder of the humility of a true Gursikh. In 1975, I returned to Amritsar. 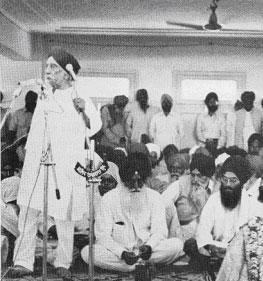 At that time Bhai Fauja Singh was in jail due to his participation in the Guruka Mail incident. It was he who led the way against those who had insulted the Siri Guru Granth Sahib and a Gurdwara. I spent a lot of time with Bibi Amarjit Kaur learning more about the details of the beliefs of their Jatha. As S.S. Sat Kirpal Kaur sat meditating in the Golden Temple she found herself looking into the eyes of a young Sikh girl and was surprised to see her wearing a turban! Sat Nam Kaur is pictured here and was the young lady who introduced S.S. 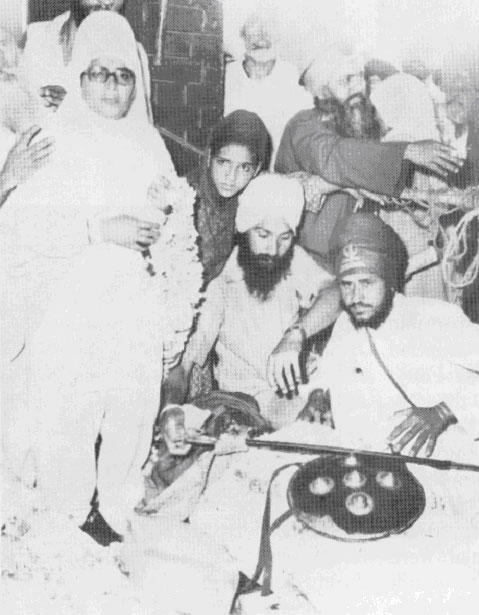 Sat Kirpal Kaur to Bhai Fauja Singh and S. Amarjit Kaur in 1975. They have patiently watched us grow as the teachings of Sikh Dharma have been unfolded to us. They always maintained that the Siri Singh Sahib was teaching us correctly but we simply didn't follow closely enough. Sometimes we laughed over the changes we went through. For instance, Amarjit Kaur and Bhai Fauja Singh had told me earlier that the women should not leave any hair on the forehead when tying a turban. I insisted that it was scientifically sound, that that was the way the Siri Singh Sahib liked it, etc. Within a few months of that con­versation, our hairs had disappeared beneath the turban per instruction of the Siri Singh Sahib. From the other side, a time came when the Bhai Sahib Bhai Randhir Singh Sikhs learned to respect our practice of yoga and even to participate. These things seem insignif­icant, but it is out of this kind of mutual understanding and acceptance that unity is built. It was a joyous day on the same trip when I learned Bhai Fauja Singh had been released from jail. By this time, I felt that he and Bibi Amarjit Kaur were my Khalsa brother and sister of old times past, and it gave me great joy and a feeling of content­ment and upliftment to be with them. We talked of God, Guru and Gurbani and of the Khalsa Panth. It was so wonderful to be in the company of the Sadh Sangat in the true sense, and, I am sorry to say, this was not the usual experience I had had among Sikh Sangats in general. These people were totally, honestly, and devotedly com­mitted to living and dying as Khalsa and to teaching others about the Dharma and the Siri Guru Granth Sahib. Up to this time, I had never been to any of their kirtans. Bhai Fauja Singh and Bibi Amarjit Kaur asked if a few of us could attend an all night kir­tan and Amrit ceremony in Ludhiana. They had told us of the way in which their Panj Piare gives Amrit and we very much wanted to experience that. Much to my disappointment, the over-all opinion of those supervising us was that we should not attend. However, we arranged that we would try to meet in Patiala, because I was to visit the University there and they had friends in that city; but it was only tentative. I can tell you that 1 prayed that we might meet again. God and Guru brought us together at the Gurdwara there. I was so happy, the smile would not leave my face. I recently saw others of our western Khalsa with those same smiles when we joined that Jatha in the village of Butala. I'm going into this detail be­cause perhaps the reader can also ex­perience the joy born out of the meeting of old souls and to give an impression of the Dharmic projection of these people and Bhai Fauja Singh in par­ticular. We stayed with the family of Bibi Kirpal Kaur in Patiala. For the first time, I heard their inspiring kirtan. Then I had a long lesson from Bhai Fauja Singh in how to recite the Jaap Sahib. In the morning, we arose early and recited the banis. Then we went to Babaji's room and he did Parkash. They showed me to what ex­tent a person can assuredly, respect­fully, devotedly and lovingly relate to and care for the Siri Guru Granth Sahib through Prakash. I was deeply moved, humbled and grateful to be an observer and participant in that vi­bration. There were hours more of kirtan, playing gatka, discussion of Gurbani and meeting other members of their jatha before I traveled on to New Delhi. A month or so later, I returned to Patiala for a few days to do kirtan at a wedding. I went to the place of the wedding, bowed before the Guru and sat among the Sadh Sangat. After a while, I opened my eyes. I couldn't believe what I saw. There was Bhai Fauja Singh. My heart lept in appre­ciation to the Guru for letting me meet my Khalsa brother again. 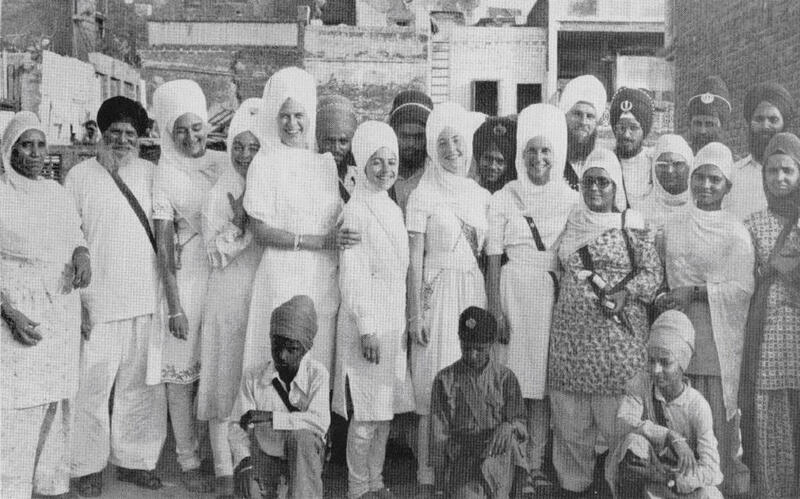 This 'group snap' was taken during the 1977 tour, on the roof of S. Amolak Singh's parents house, just after kirtan and langar. From left are pictured his parents, S.S. 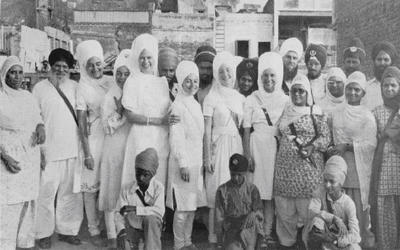 Sat Nirmal Kaur, S. Harkrishan Kaur, S.S. Nirbhao Kaur, S.S. Guru Meher Kaur, S.S. Siri Sadhana Kaur, S.S. Sat Kirpal Kaur, S.S. Karta Singh, S. Amarjit Kaur (wife of martyred Bhai Fauja Singh, and directly behind her is S. Kaval Singh who was also martyred on Baisakhi Day, 1978. After another month in New Delhi, I returned to Amritsar where the three of us and S.S. Soorya Kaur Khalsa spent many, many educational, inspiring warm hours together. One day, I remember Bhai Fauja Singh took me to meet several friends of his. After leaving the home of a woman he called his mother, I remarked about the beauty of the simple rough brick floor because it was so clean. A few days later, I had dinner at Bhai Fauja Singh and Bibi Amarjit Kaur's home. Because of his active nature in opposing any wrong-doing among Sikhs, it was difficult for them to find a home. People were afraid to rent to them; they were afraid they would draw trouble. 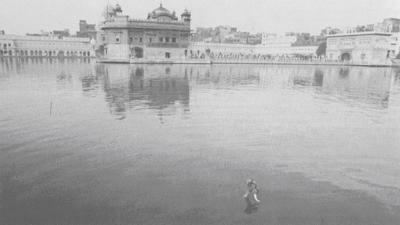 From the time in 1973 that he had decided to devote his life for the pre­servation of the Khalsa in India, they had gone from a modest upper story flat in view of Akal Takht to a pantry room atop the roof of a building that was in great disrepair and located some distance from the Harimandir Sahib. As I entered that room, I felt totally humble; the brick floor of that small and simple room was spotless and still damp in places. Bhai Fauja Singh had scrubbed it three times. We fondly and lightly called that room their "broken house". We also looked forward to the day when I would be able to share that "broken house" with them. As of then, however, we were not able to move so freely among the Sikh community. It was at that time that Bhai Fauja Singh explained the political nature of many Sikhs and the vast amount of missionary work that was needed in India. 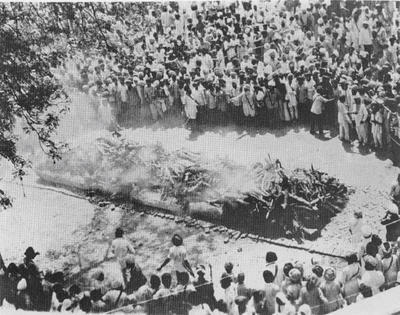 I didn't want to hear about Sikh politics or Indian politics, but now I understand that it is political entangle­ments which created the massacre on April 13, 1978. `Fauja' means soldier, and certainly he lived to his name. 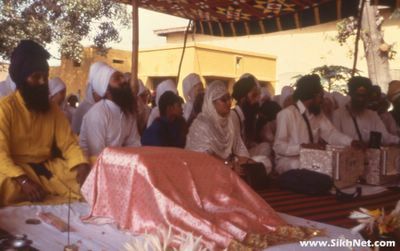 He was totally committed to defending the purity of the Guru and the Khalsa, and his wife was there to serve and support him in that mission. 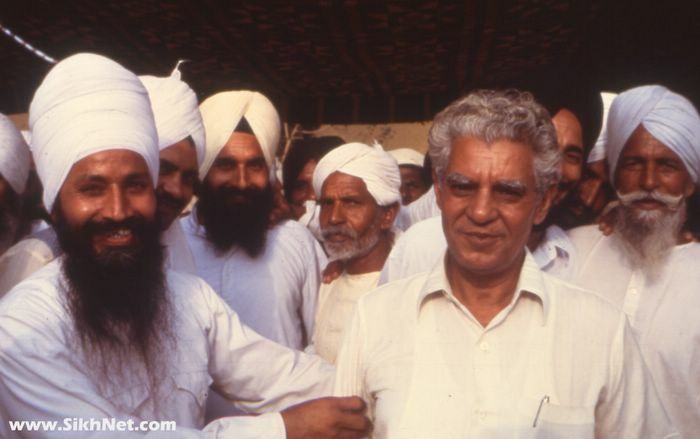 When I returned to Amritsar in 1977, he was again in jail, this time awaiting trial on charges of murder of a man who had beaten a young woman who was a member of their jatha. On the outside of the jail Amarjit Kaur had been work­ing very hard to prove his innocence. Inside the jail, he was also working hard. He was doing his missionary work and many of the inmates had become Sikhs, as well as the young son of a Hindu man who was in charge of the jail. By this time, Bhai Fauja Singh was no longer wearing western style suit and black turban, but was in the white bana of Guru Gobind Singh. At first he had been content to remain in jail, meditate and continue his work, but he had recently come to the reali­zation that his leadership was needed beyond those jail walls. The fall of 1977 was the celebration of the 400th anniversary of Amritsar. About 100 of us had come for this function and to travel to other cities and villages to do kirtan and parti­cipate with the Sadh Sangat. Had it not been for the Bhai Sahib Bhai Randhir Singh Jatha, particularly Bibi Amarjit Kaur, we would never have traveled to any villages or cities because the S.G.P.C. was much too busy to make these arrangements. There were several memorable visits to villages, times of kirtan and gatka, Sangat and Pangat. I'm sure those buses in which we rode have never heard so much kirtan. We would re­turn late at night, contented, inspired and still singing with our Khalsa bro­thers and sisters. During that time period in India, there was a campaign underway to slander the Siri Singh Sahib and Sikh Dharma of the Western Hemisphere. Bhai Fauja Singh sent me pages of questions. He wanted each and every detail and reading material so he could formulate his position and communicate it to the presses and the Indian leader­ship. He came out in complete support and recognition of the Siri Singh Sahib and his work and challenged those who had not transformed even one Indian Sikh and who would yet criticize the Siri Singh Sahib. Toward the end of our stay, about forty of us went to Gurdaspur jail for Gurdwara and kirtan. We were totally humbled by what we beheld there. A man all in white and with a radiant face and humble nature greeted each one of us with `Wahe Guru Ji Ka Khalsa, Wahe Guru Ji Ki Fateh.' We could tell he, too was excited by our joining there. Bhai Fauja Singh won the hearts of everyone. The walls of the courtyard bore beautiful and simple placards of Gurbani and in the center was the Gurdwara and the Sadh Sangat. The only way to distinguish those Indian Singhs who had come with us from those who live within the jail was that the latter could not wear their kirpans. We were graciously served langar within the cell confines and then moved back into the courtyard. Sitting there doing kirtan, I was bounced back and forth between two realms. At one moment I would look at the Sangat and feel physical and mental pain at seeing these men in turbans sitting in a jail and then I would think, "No, our bodies are also jails, but for our souls." Most of those men were in turbans because of the efforts of Bhai Fauja Singh. The peace and joy he was experiencing from kirtan and Nam Simran spoke to my inner being. Later he pointed out to me that this time he could clearly understand our kirtan, where in the past, he had to listen carefully before he could be sure what shabd we were reciting. After kirtan, he spoke out strongly in support of the Siri Singh Sahib and Sikh Dharma of the west. About two weeks later, Amarjit Kaur, Swami Singh Khalsa and myself went to visit him again. The jail authorities openly expressed their great respect, trust and love of him. As some other Sikh prisoners have done before, he had refused the facilities open to him because of his education and profession, and had instead requested lesser quar­ters in order to be with more men, those men who needed the teachings he carried. At this final meeting of ours, he urged me to push for the Khalsa of the west to work more directly with the Khalsa of India. The ice had been broken now. He urged me to ask the Siri Singh Sahib to send over small groups which could live among their jatha, learn the language and our Khalsa history and heritage in depth, and travel with them to systematically do missionary work in cities and especially in villages. He felt that the building blocks of the future of the Khalsa in India lay in the village masses. He was more universal in vibration than I had ever seen him before, and was absolutely one-pointed on the unity of Khalsa of east and west and upon his responsibility to help the Khalsa ofIndia. He stated it was up to God and Guru to free him from his current abode and firmly believed Guru Gobind Singh had given him that time to meditate, regain his health (they cooked their own meals as Bhai Sahib Bhai Randhir Singh had done when he was in prison), and to create Khalsa among those men. As we parted, I knew that the hours we had spent together in the past, light-hearted, warm and personal, would never come again. He, in par­ticular, was detached from that now and looked instead to each of us having a much broader relationship with the Khalsa. He, as a brother had planted a seed, and wanted to see the fruit born as unity of Khalsa and the sal­vation of the eastern Sikhs. Khalsa brothers of the East and the West share the experience of living the practical life of a soldier/saint. 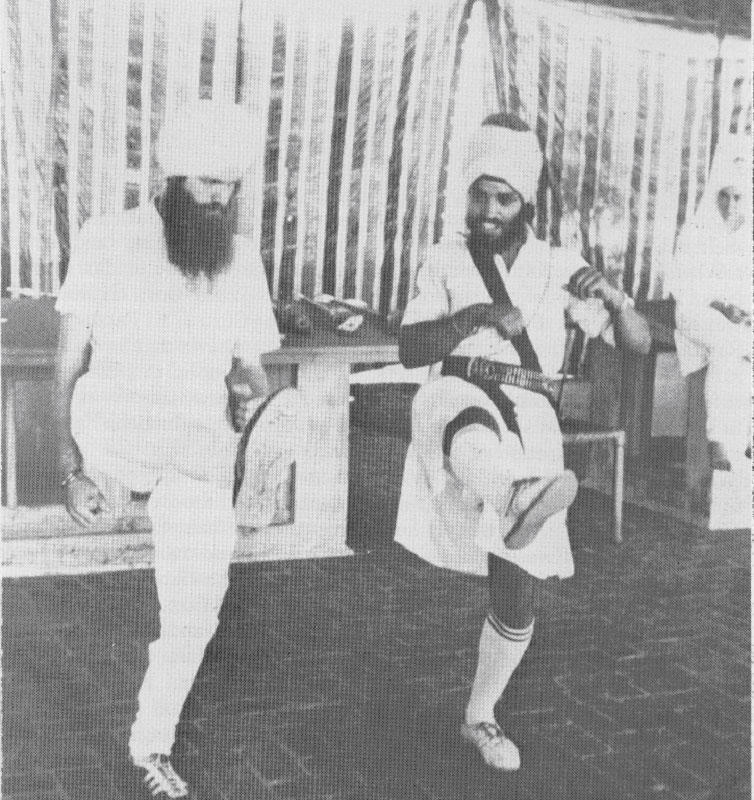 M.S.S Livtar Singh Khalsa on the left receives a practical lesson in 'Gatka' (Indian sword fighting) techniques. 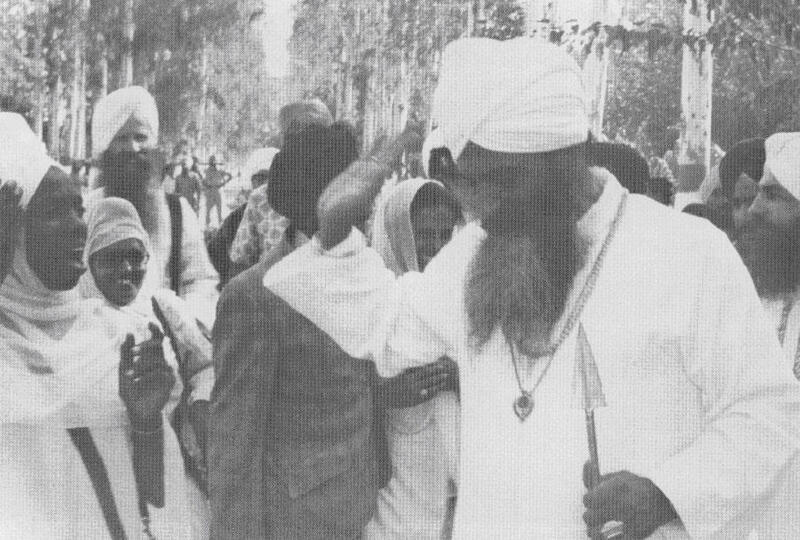 The Siri Singh Sahib carries the arrow presented by S. Amarjit Kaur as he crosses the Pakistan border during his visit in 1977. At this time, he also assured us that we need not worry about the safety of the Siri Singh Sahib when he came to Amritsar for the 400th anniversary celebration. He gave Bibi Amarjit Kaur a list of Singhs who could be counted upon to come at a moment's notice and who would die to protect the Siri Singh Sahib. Ultimately, it was their jatha which was called early one morn­ing to offer the Siri Singh Sahib safe passage from India to Pakistan. They were the only group that openly and unreservedly came to our aid. At that time, Bibi Amarjit Kaur greeted the Siri Singh Sahib and presented him with an arrow, and he in turn took the dust of the feet of her and Bhai Joginder Singh, another member of their jatha. 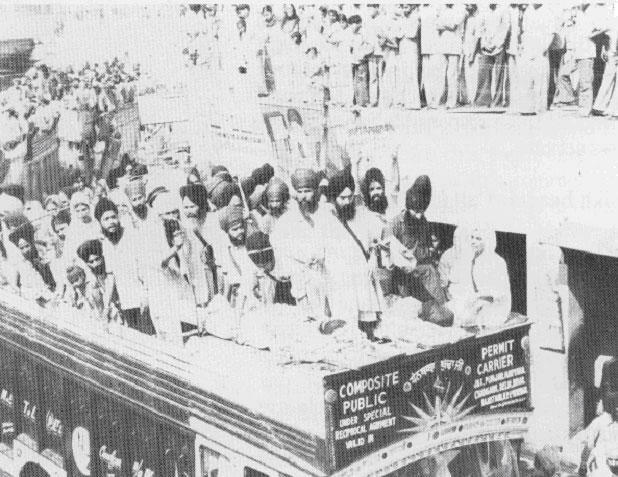 When our group left Amritsar for New Delhi and our return to the United States, the Bhai Sahib Bhai Randhir Singh Jatha met us at the railway station loaded with baskets of fruit. They were the only Indian Sikhs to see us off. This was a change from the S.G.P.C. participation of the past. `Wahe Guru Ji Ka Khalsa and Wahe Guru Ji Ki Fateh' rang back and forth among us. There were tender hugs between Singhs. It was about to end, and then Bibi Amarjit Kaur suggested they ride with us to the next train station about an hour and a half away. We enthusiastically voiced our approval Many of them boarded with us. As our train pulled away, some of those re­maining ran beside the train, giving us kirpans and iron karas. We spent the next 11/z hours in Gurbani Kirtan. That ride none of us will ever forget. There was one really amusing thing. Bhai Joginder Singh was playing tabla and someone put the stereo headphones of their tape recorder over his ears. He was totally delighted as his sur­roundings were nothing but the sounds of Gurbani Kirtan. People had one of two appearances at that time: either eyes closed and meditating and singing or eyes open, singing and smiling. Then at the city of Jullundar, we shared our last `Wahe Guru Ji Ka Khalsa and Wahe Guru Ji Ki Fatehs'; and now history has shown that for some, it was a final parting on this plane and our last voiced farewells. Within a month, Bhai Fauja Singh had won the right to appeal his sentence of life imprisonment and was released until the courts would consider his case. 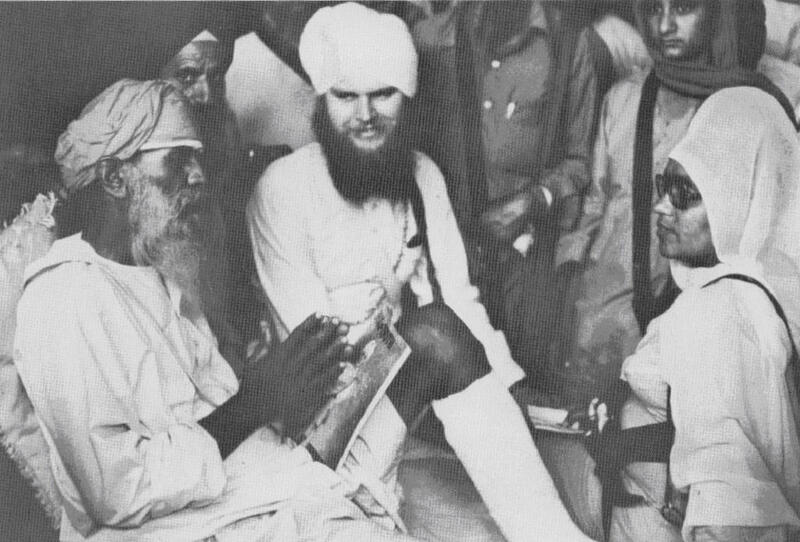 He immediately resumed his missionary endeavors, especially work­ing to lay a foundation to unite some of the Sikh factions into a common Khalsa Panth and teaching about the meaning of Gurbani. In the end, Bhai Fauja Singh led a group of Singhs on Baisakhi Day to peacefully protest against those Sant Nirankaris who were slandering the Sikh Gurus and insulting the Siri Guru Granth Sahib. Though they went with no attitude of aggression toward any people, each also went with the attitude that it is the Guru's blessing to give one's head in defense of the honor, dignity and purity of the Siri Guru Granth Sahib and its teaching as manifest in the Sikh Gurus and the Khalsa. In April of 1978, when I returned to Amritsar, it was to pay respect to the Thirteen Martyrs of Amritsar on behalf of the Khalsa of the Western Hemisphere. I shall never forget the ex­perience of seeing those dear brothers of the Bhai Sahib Bhai Randhir Singh Jatha in the Sadh Sangat of Manji Sahib and Bibi Amarjit Kaur sitting near the Guru. Visiting those wounded Singhs in the Guru Teg Bahadur hos­pital, seeing their physical state and their soaring spirits, taught me once again what Khalsa spirit is, what a saint-soldier is, and what it means when we say "When things are down and darkest, that is when we stand tallest." God and Guru know Their ways. At our last kirtan before leaving Amritsar, I sang the shabd that Bhai Fauja Singh sang when we visited the home of the parents of the young girl who first brought us together. He had his arm around her father and both were shedding tears of joy. when thou are mine, 0 Lord, What more do I require then? Just as we are attracted to and pick the most beautiful and perfect flowers in a garden and bring them into our homes, so God took Bhai Fauja Singh and those other great Singhs and let them lay their heads at His lotus feet in service to their dharma. Yet God does not want the garden to go untended. 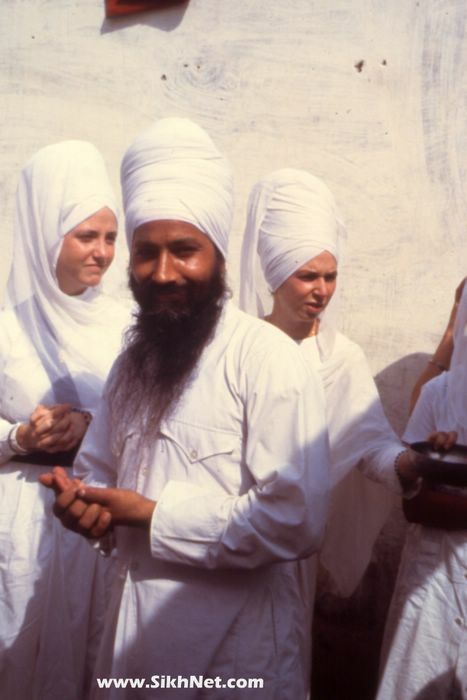 For each Gursikh that was plucked that day, hundreds should blossom forth in full beauty to carry on the mission of the Khalsa that others may experience the divine fragrance of the Nam. Wahe Guru Ji Ka Khalsa Wahe Guru Ji Ki Fateh! Last summer I was blessed with a sight and dip in the nectar tank of the Siri Harimandir Sahib. I had tra­veled to Amritsar alone and spent most of the first part of my stay there very much alone except for the growing friendship with my only True Friend. When things were down and darkest and my body and soul were crying out for help, a man in a black turban appeared and in his company my spirits soared. We had been doing seva together for weeks, and when I asked him, a shy and very humble man, why he had come to me, he said that he had told his mother of me, and she said, "Go and serve him." He later told me when the Guru sees one of his Sikhs in trouble he always sends an­other to help. It's the Truth. The Siri Singh Sahib inspired me to become a Sikh of the True Guru; this man in the black turban showed me by his love and devotion how to live as one. 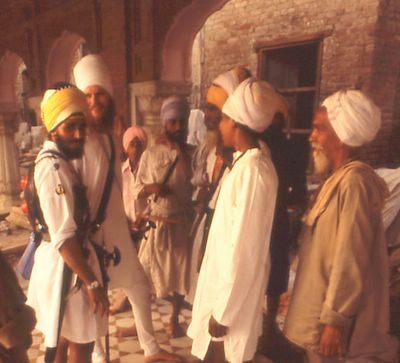 We traveled to Anandpur Sahib together and he taught me what it meant to wear the kirpan of Guru Gobind Singh. We wore the kirpan by day and by night and he showed me how to change my kurta without re­moving my kirpan and how to tie my kirpan onto my turban while taking an early morning dip. He would not com­promise his Guru. Once I asked him, "If we carry this kirpan to defend the Dharma, why not carry a 44 magnum?" He said, "You must have faith." Be­fore I left Amritsar, I told him that they wouldn't let me take my kirpan on the plane. He said, "But you have to try." He is right, we must try. It was only after I had returned to the U.S.A. that I learned of the Bhai Randhir Sikhs, and each day I feel so blessed to have been touched so lightly yet so deeply by a man and his family who are the humblest servants of God I have ever had the privilege of meeting. I pray every morning to my Guru that I may be a fraction of the Sikh that he and his family are. We were accommodated so graciously that it was difficult to remember that this was a prison until we were taken to our place of rest-Bhai Fauja Singh's cell. It was there that we met more of the Bhai Randhir Singh Sikhs-men, women and children-families that had a definite and strong vibration. They were, too, the true sons and daughters of Guru Gobind Singhji, living as Khalsa with an unmistakable light in their eyes that one does not forget over time. 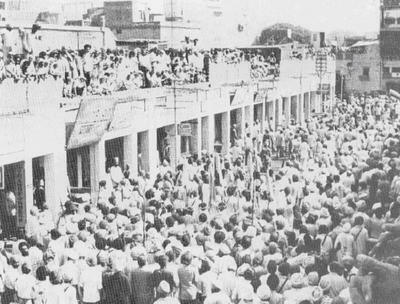 A strong identifiable bond was being made at this time in the minds and hearts of many Sikhs of the East and West who were at the jail. The spirit and reality of a Khalsa unity were coming even more alive as I listened to Bhai Fauja Singh's speech in which he voiced support of the Siri Singh Sahib and the Dharmic work he and we were doing in the West. Bhai Fauja's Singh's support and respect were gen­uine and deep. He realized and recog­nized the Sikhs of America as the beginning of the fulfillment of the pro­phecy of Guru Gobind Singhji. 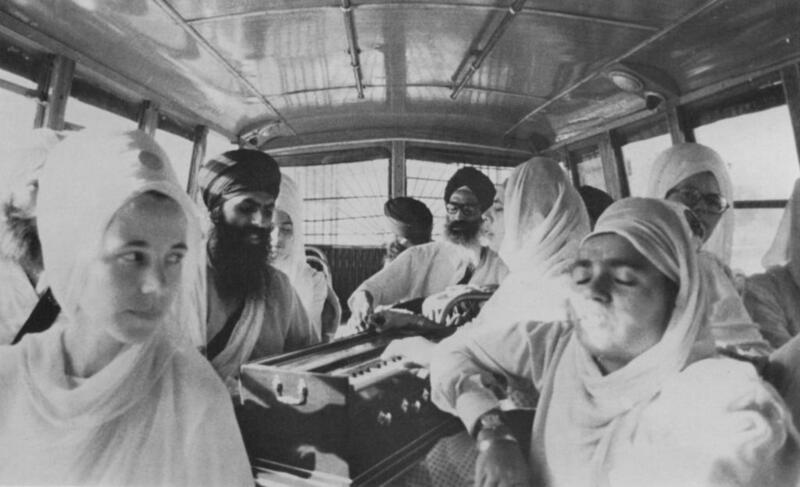 In the weeks ahead, S. Amarjit Kaur and others were to work together closely with us scheduling many and varied kirtan programs that exposed us to and allowed us to share in the energy of many of the Sangats in villages in remote and nearby places as well as larger Sangats in different cities. The Guru's word was being shared in its pure form and the form and spirit of the Khalsa is being spread. At the jail the heat of the day was approaching its height as I and others sat in Bhai Fauja Singh's cell resting. At my side appeared a young girl of about 9 years. Her eyes were the first thing I noticed after her tur­ban. (I had not seen many turbaned women in India and noticed right away the presence of a turban on the Bhai Randhir Singh Sikhs.) Her eyes were deep brown and very bright and smil­ing. She said a few words in Pun­jabi and pointed to my daughter of 6 months and very sweetly and yet bold­ly held out her arms with the desire to take her and play with her. She had a very vibrant and graceful energy and she and my daughter cooed and played for some time. She again respectfully and sweetly returned Siri Pritam Bhagwati Kaur to me. I didn't see this young Sikh girl again until I noticed her in the open air gurdwara singing and sitting very beautifully. It was a rare treat to see such a child in her full bana and with such a graceful pre­sence at her age. She had captured my respect and my heart and the clarity and delight of her smile I have not yet forgotten. During the visit to India in 1977, S.S. Swami Singh (center) spent a lot of time preparing himself in the act of Gatka (Indian sword fighting) and enjoy­ing the friendship of two Khalsa brothers, S. Amolak Singh and S. Kewal Singh (killed in Amrit­sar on Baisakhi Day, 1978). At another village I saw her again and it was there that I realized the quality of her environment as I met her mother, father and brother. I saw there the art of gutka performed by her father and brother and felt the strong commitment that this family and these Sikhs of the Guru brought, taught and gave to their children and their own lives. The beauty and fun (with a dash of competition) that the father and son exhibited in their Dharmic play was wonderful. It was done with the spirit of fun but with a respectful serious­ness also. The tradition of training the children to be skilled in the use of weapons as well as the Guru's bani was never so apparent and very in­spirational to see. The spirit of the Khalsa had been awakened and was being lived in its forms and facets by these Bhai Randhir Singh Sikhs. 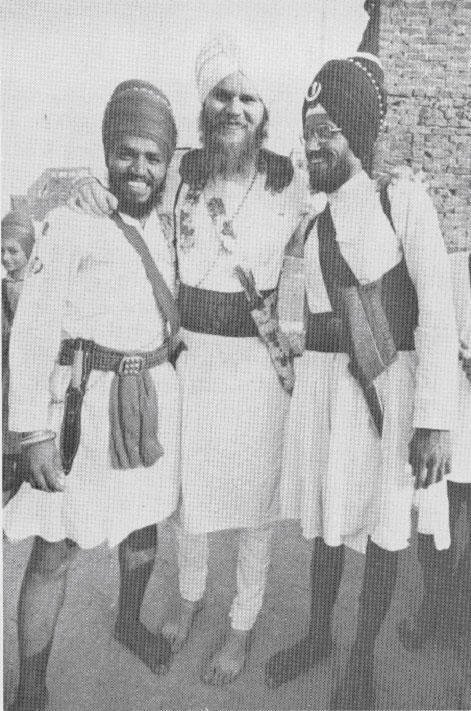 Brothers from opposite ends of the world unite in the oneness of Khalsa, during the Indian tour of September/October of 1977. From left: S. Bakshish Singh, a young brother, S. Maha Bir Singh, S.S. Swami Singh, S. Kirpal Singh, S. Amolak Singh, S. Siri Gurmukh Singh. 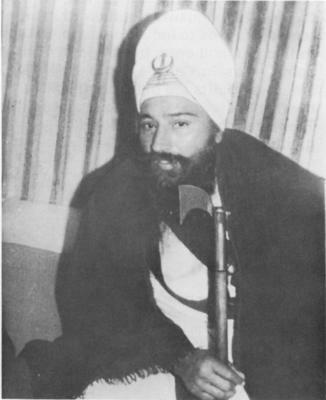 Sant Kartar Singh, who was the spiritual leader of the Bhindran wale Sikhs until he died in 1977, met with our American Sikh family and here is pictured showing one of his swords. Another more personal experience stays in my mind regarding these people too. One of my last days in Amritsar while walking around the parkarma one morning, on my way back to Guru Nanak Nivas, I noticed a Bhai Randhir Singh man ahead of me. I admired the strength of his projection and noticed the chakra around his head and thought to myself how great it looked on him. No sooner than the thought came into my head though, he turned quickly around, folded his hands and bowed saying, "Wahe Guru Ji Ka Khalsa, Wahe Guru Ji Ki Fateh" and placed this chakra over my turban as I also bowed. What a surprise, indeed. I felt a little bad for thinking such a thing and tried to give it back to him, but he insisted I keep it saying, "It is yours, my sister." All I could say in return was "Wahe Guru". There is a true bond of friendship that we established with these people, that will never go unbroken. Happy am I, that I got this beautiful chance to be with them and know them. 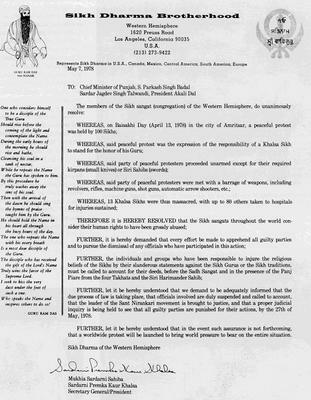 Letter by Gurunam Bhajan Kaur Khalsa Washington, D.C. This past fall I had the honor to visit India again. It was a short trip-just two weeks-but during that time I went to a kirtan held by the Bhai Randhir Singh Jatha. I met, talked with, and sang kirtan with them. The men, ladies, the children, and the elderly. There was no doubt, there was no Indian Sikh, no American Sikh, ­just Khalsa. They vibrate as we do. I trust them as I trust us. The light in their eyes is the same as the light in the eyes of my 3HO brothers and sisters. I love them, I will live for them and die for them as my very own family. When I met Amarjit Kaur, I was amazed at her strength and beauty. I started to weep when she told me that her husband was in jail. She smiled glowingly and told me how happy he was to have the chance to meditate. I was told that Bhai Fauja Singh had described to her how he would look at his death, and that if anyone of their family cried at his funeral to slap their face. Never had I heard such words of courage, strength and detach­ment in the face of death. Their tragedy is ours, our support is theirs, their sacrifice is ours, our strength is theirs. We are not separate. Our man­tra is one, our tradition is one, our Guru is one. As we got off the bus in Gurdaspur, S. Amarjit Kaur told me to go on to the jail. The three o'clock sun was as blinding as the entry way was dark. I just stared at the man dressed in perfect white bana. He opened the barn like door of the prison, so I assumed he was the jailer. He was smiling at all the Bhai Sahib Randhir Singh Sikhs who came in, and as it turned out he was the prisoner sentenced to life imprisonment for defending a raped wo­man. Bhai Sahib Fauja Singh could not be contained in a prison cell. He was the host of the jail, generating 'Cherdi Kala'. The Bhai Sahib Randir Singh Sikhs were in soaring high spirits. His wife, Amarjit Kaur, led the American Sikhs on a tour of the prison. It was a tremendous relief to see that Bhai Fauja Singh was under such light security that he could organize the Gurdwara. He proudly showed us his private cell and the cell next to it for his devoted Sevadars. Such a leader of righteousness could never be put down. He fought and fasted to attain his cell for meditation. It was a square dark room containing a huge mattress. There was a little hole in the roof but other­wise no windows. The door opened on to a private yard where he set up a stove (one rectangular oil tin) with a round steel water pot on top. This was where he prepared his own food. The walls were yellow painted adobe. It contrasted greatly to the modern red brick walls holding back short haired men ganging together at the opening of the wall to stare at us. Bhai Sahib Fauja Singh was the light of the prison, the inspiration for the prisoners and us! 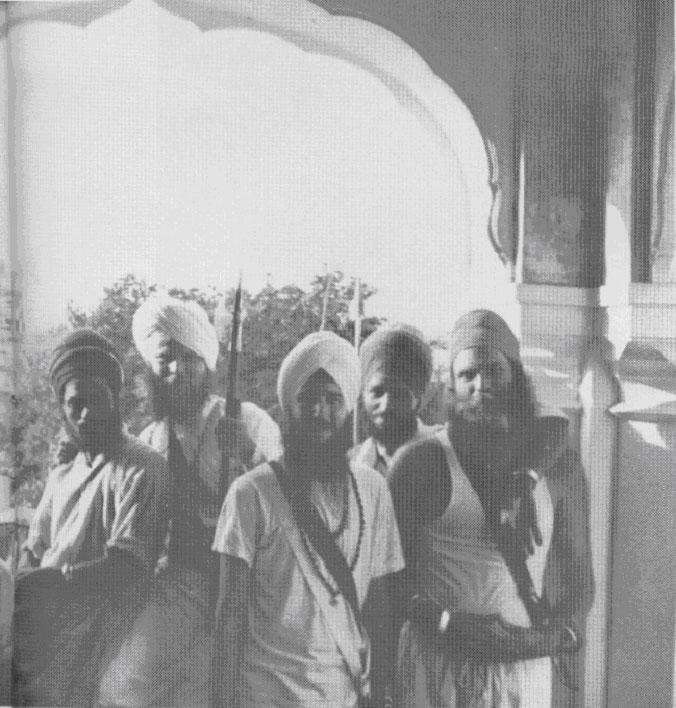 The men re-converted to Sikhism were elevated from prison life. The faith in the Dharma took them beyond their situation. They were eternally grateful to their leader for their new beards. His concern for his fellow inmates was so deep that when he left the jail, they were still a major concern. "I look to Bhai Sahib Fauja Singh as the standard of the Khalsa"
S.S. Sat Kirpal Kaur Khalsa, the Assistant Secretary General was grateful to meet dear friends at the hospital in Amritsar. 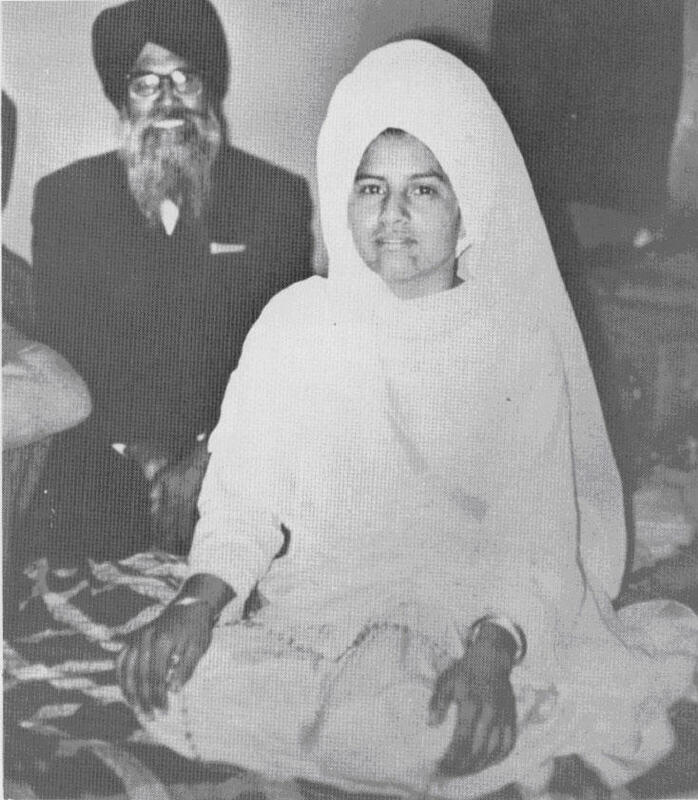 Here she is pictured at the bedside of Sardar Amolak Singh. 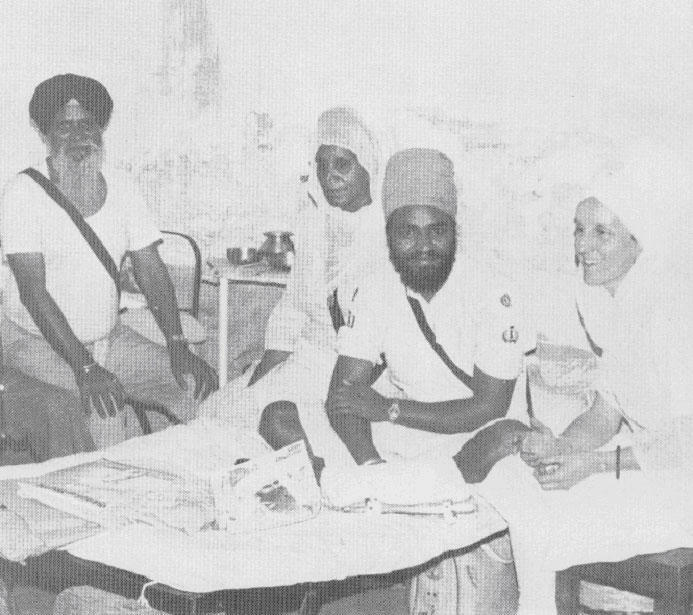 The American Sikh representatives visited the wounded survivors at the hospital, and Sardar Hazara Singh tells the stories of heroism to S.S. Swami Singh Khalsa and Sardarni Amarjit Kaur (wife of the martyred Bhai Fauja Singh). In the fall of 1977 I joined the yatra to India. During this trip, by Guru's grace I met some of our most beautiful and inspiring Khalsa brothers and sisters, the Bhai Randhir Singh Jatha. My first encounter with the Bhai Randhir Singh Jatha was during our first village trip to one of their Jatha's personal homes, near the town of Jullandar. As we arrived, the day had be­come quite warm. The home itself was clean and simple and set in the peace­ful surroundings of farm land. Next to the home, a large colorful tent had been erected for the Gurdwara. The Gurd­wara service was already in progress as we departed from the buses. 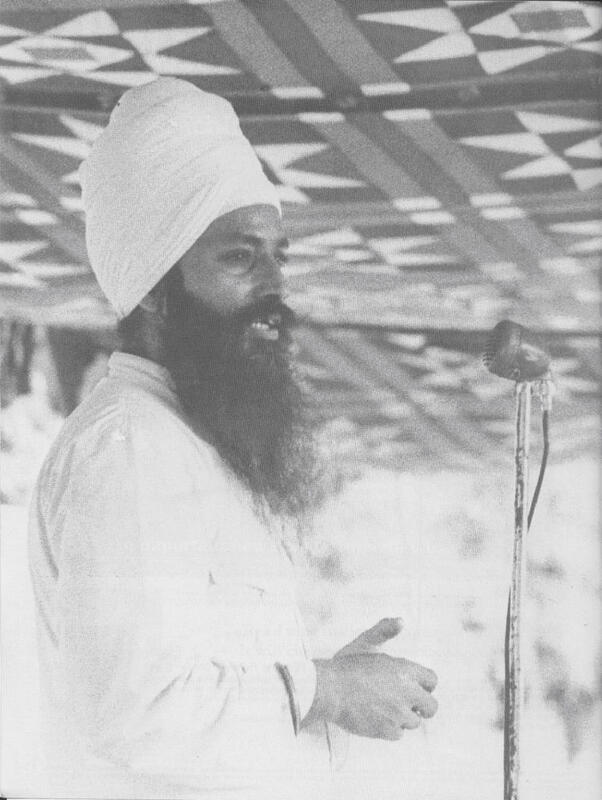 The Bhai Randhir Singh Jatha received us grac­iously with open hearts. They invited us to their home, to rest and partake in some breakfast. Slowly everyone began to congre­gate under the large tent to join to­gether in reciting Gurbani Kirtan. I will never forget the experience of being in Gurdwara that day. I can clearly remember walking up towards the Guru to pay my respects, and hearing an incredibly spirited sangat of Khalsa brothers and sisters chanting the Guru's hymns. I went to sit down be­hind them. As I sat listening and watch­ing them, I became immersed in their powerful, spirited performances of singing God's praises. All were dressed in the garb of Guru Gobind Singh. The group of ragis was large and tightly knit with several of them adding to the rhythm of the sound by playing me­tallic percussion-like instruments. I was enthralled when I first heard and saw the Bhai Randhir Singh Sikhs break into a continuous, vigorous and energetic recitation of "Wahe Guru". Their faces were so radiant and medi­tative as they rhythmically tossed their heads to one side in unison while chanting. It was contagious and I soon found myself joining them. The energy was very high as we all chanted together. I began to feel a peace and tranquility created among us. A link between the new Western Khalsa and the Bhai Randhir Singh Sikhs was becoming manifest, a link never to be denied or broken. I cannot remember when I last felt so much at home. I had no reservations at the thought of spending my life with them. 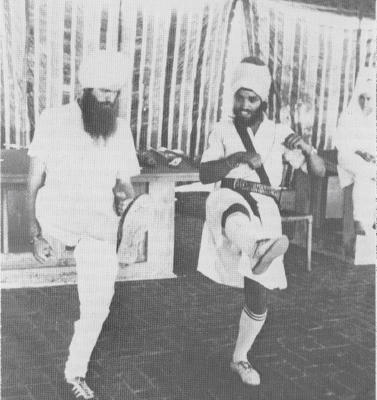 They always seemed to give their all, whether in kirtan or serving langar lines. 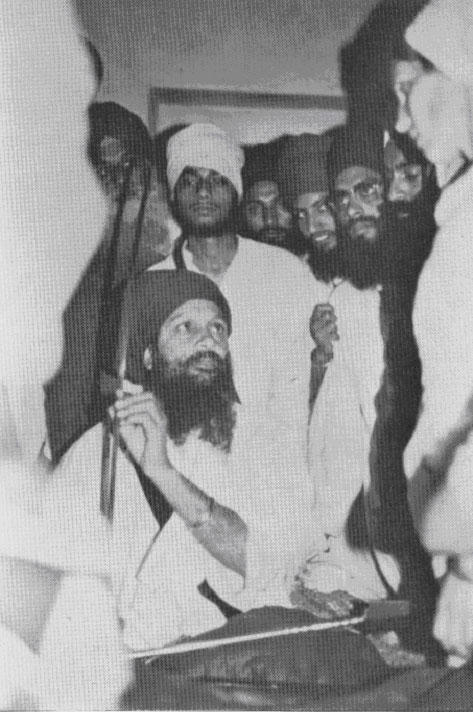 In the eyes and faces of the Bhai Randhir Singh Jatha, I became aware that a life of service to God and Guru was the key to fulfillment and radiant happiness. What more is there in this lifetime for a Guru Sikh, than to be in the company of the Holy, leading a simple well-disciplined life of worship and ser­nice? My prayer is that all Sikhs may be as one-pointed in their devotion to humanity and God's service. Bhai Fauja Singh was like a gardener who selflessly and joyfully planted the seeds in the Indian villages in hopes that the spirit of the Khalsa would be reawakened.